THE ISRAEL ANTIQUITIES Authority recently offered a rare glimpse into its storerooms, where staff said recent archaeological discoveries have cast new light on life at the time of Christ. The event was organised ahead of the upcoming Christian holiday of Easter, with today marking the resurrection of Jesus following his crucifixion. Among finds from the first century AD discovered around Jerusalem and the Galilee, where the Bible says Jesus lived and preached, are vases, cooking utensils, a wine press, nails used in crucifixions, jewellery and ossuaries. “Nowadays we can restore in a very clear way the daily life during that period, from the moment of birth, through the person’s life, his dining customs, where he travelled across the land, and until his day of death including his burial,” Gideon Avni, head of the authority’s archaeology division, told AFP. “Over the past 20 years we have made a great leap in understanding the way of life of Jesus and his contemporaries,” he said. Every week new elements are discovered which allow a better understanding of this period. 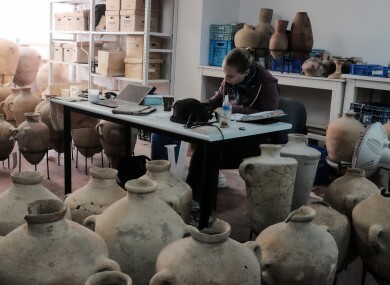 Avni said that the authority is custodian of more than one million objects, and each year receives about 40,000 new finds from about 300 archaeological sites. “The essential thing for us is to be able to understand very precisely the way of life in the time of Jesus, from birth to death,” he said. The authority also displayed coins from the late Byzantine period, which had been concealed by their owner inside the wall of a building, apparently as he fled an invading Persian army. “He probably hoped to go back and collect it, but today we know that he was unable to do so,” archaeologist Annette Landes-Nagar told journalists. She added that the nine pieces from the seventh century AD were discovered in the ruins of a building used by pilgrims on the road to Jerusalem from Jaffa seaport. Remains of a Byzantine church were excavated nearby last month. Email “Nails used in crucifixions among recently discovered artefacts from the time of Jesus”. Feedback on “Nails used in crucifixions among recently discovered artefacts from the time of Jesus”.